I think gardeners, and veg gardeners in particular, fall into two types. There’s the fair weather gardeners who give it all they’ve got from spring until autumn and then retire gracefully indoors to put their feet up with a sigh of relief (and who can blame them?) when winter arrives. I belong to the other camp, which is nutty enough to want to keep gardening through the winter. And the UK has a great tradition of winter veg gardening; possibly because we’d starve otherwise! But a lot of winter veg is big and had to be sown or planted earlier in the year – winter cabbages and kale, Brussels sprouts, leeks and parsnips all need to be in the ground by now in order to give a decent harvest. But that doesn’t mean there’s nothing you can sow at this time of year if you’ve got a mind to (or itchy green fingers, which is my trouble!). 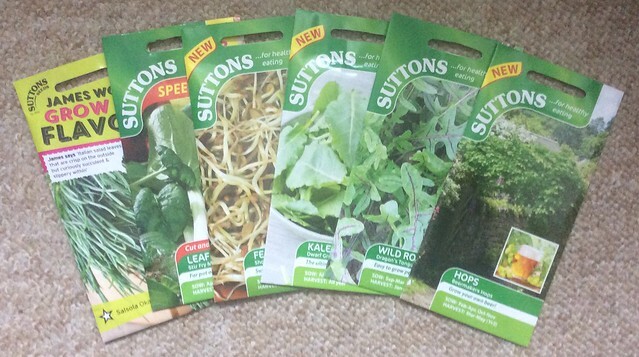 Suttons got in touch with me to tell me about their selections of seeds you can sow in October – they’ve got lists of flowers to sow in October and vegetables to sow in October, which is very handy. And they offered me some free seeds to review, which is a bit like offering an alcoholic a tour of the local gin distillery, but I did try and confine myself to seeds I can actually use this year! The Hop seeds are probably the only ones I can sow outside at this time of year. They’re hardy perennial plants, and seeds can be sown in spring or in autumn. It will also be a couple of years before my hop shoots (apparently a perennial vegetable delicacy) would be ready to harvest. 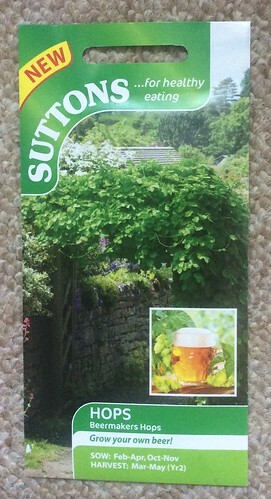 And if you want hop flowers (for beer or sleep pillows) you need female plants, although there’s no mention of that on the packet. Hop plants are normally dioecious, meaning that male and female flowers appear on separate plants. But we’ll cross that bridge when we come to it…. 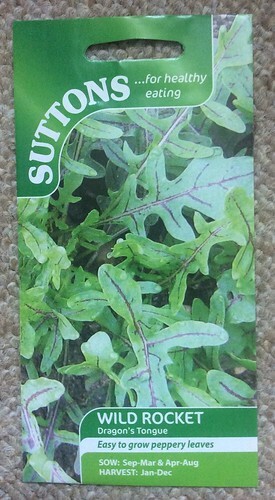 I’m warming to rocket, as long as it’s mixed with other things in a salad, and I couldn’t resist a variety called Dragon’s Tongue, which has attractive red leaf veins which will add a nice touch of colour. 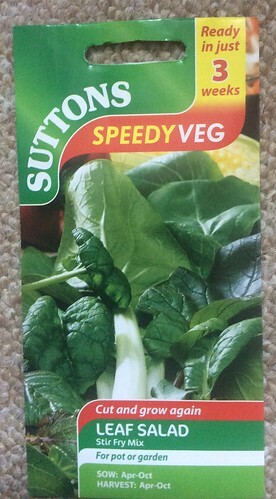 You can sow rocket pretty much any month of the year; inside from September through until March and then outdoors in spring and summer. Using the thinnings and treating it as a cut-and-come crop (and eating the flower shoots!) you could probably eat rocket every day of the year from a couple of small pots, and successional sowings. I don’t think I’ll sign up for that challenge, though, since I’m not a rocket addict yet. The second variety is Kale shoots, which are more microgreens than sprouts, since they require sowing into a tray of compost. 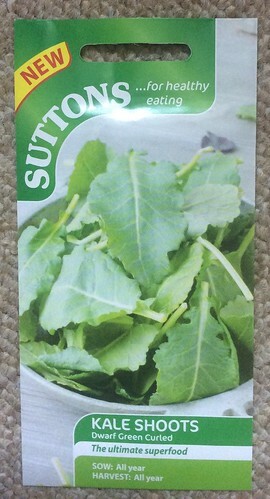 In four weeks you can have little kale leaves from a tray on the windowsill. We’re not convinced we like kale, but we’re willing to give baby kale shoots a go! And my final choice is Okahijiki, land seaweed. 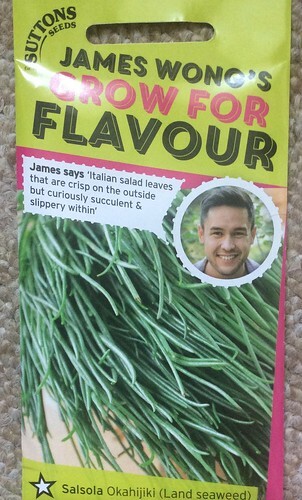 I have been growing agretti, Salsola soda this year, an Italian vegetable that is – quite frankly – an unrewarding pain to grow in our climate. I have managed to grow a couple of plants to maturity, and we’ve even eaten some. I’m hoping that Okajijiki, Salsola komarovii), a closely related plant that hails from Japan, will be easier to grow, although I’m a little dubious about it being an indoor windowsill crop. But we shall see! So those are my choices. Keep an eye out here on the blog for updates. Do you have seeds you’re intending to sow in October? New varieties or old favourites? Indoors or out? There’s no need to stop gardening when the days get shorter – you just have to do more of it in the dark! Whatever you do, do not let diplotaxis tenuifolia (wild rocket) flower. I had a couple of plants in a pot a few years ago, now I have n inexhaustable supply growing all over the place. 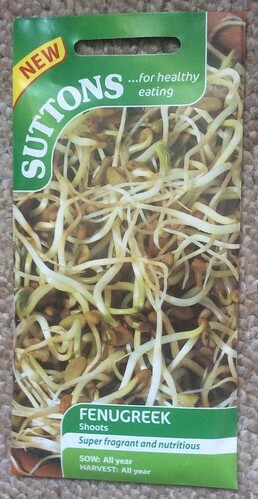 I am also an unconventional gardener and will be sowing field beans now hoping not to attract mice who like them too! Some for green manure but some to eat very small like mange tout and a bit later as small beans. The rest for seed to start all over again. Fenugreek, green lentils, mung beans,cress mix I sprout together every 3days for continuous supply and healthy lunch salad addition.